I had one that bloomed for 10 years straight. It was in a small pot underneath a skylight. I gave it diluted Miracle-Gro blooming houseplant fertilizer once in a while. For a few years I didn't know why I had heard African Violets were hard to grow. Eventually I moved and still have to find the ideal conditions to get them to flourish. It was just so easy before. But here's the difference. 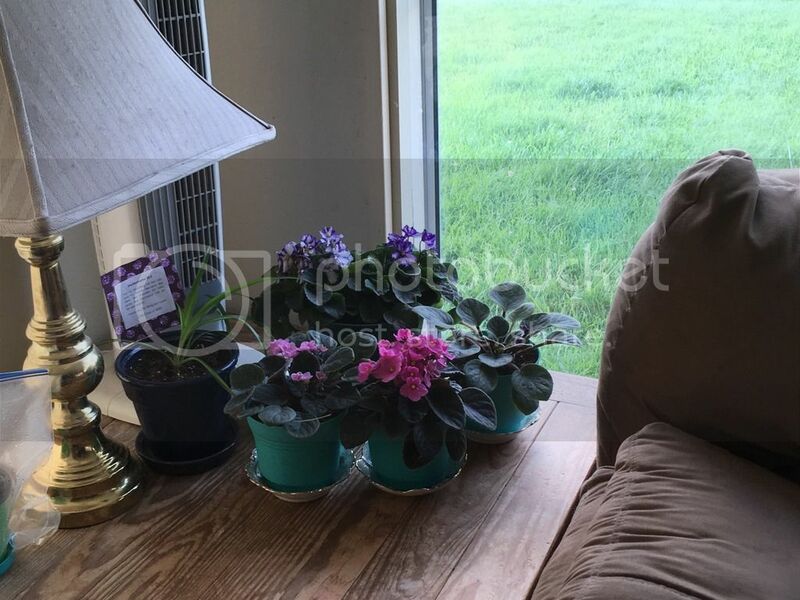 The house I lived in where the African violets grew so big they looked like large pots of begonias, except different color... and never a problem...the usual watering at the bottom and fertilizing. But the only real difference was the location. Also excellent for cyclamen, btw. It was a room at the end of the house. But didn't have a side window. With a white tile floor, not glossy, soft white walls but not blinding. We put our white wicker furniture in there. There was a high roof, peaked. There were skylights on the back of that roof. There were two very tall windows at the back of the room and two very tall windows in the front. The back of the room was where the sun came up. But the room faced more North than East. And because the rest of the house was bumped out at the back that protected it from direct sun. It did get lots of light though. Of course, the light bouncing off the soft white in the room too. In the front were the tall windows too and more North than West afternoon sun. Again, the house bumped out forward, protecting the windows from harsh sunset but letting in lots of light. South, SW and SE were wooded, further from the house letting in light but tall enough old trees to do a great job protecting from harsh sun even on the south side....where there were no indoor flowers. Plants were located in the middle to front of the room but several feet from the windows. So all I can think is what works is lots and lots of light, extra in the morning (as from the back skylights although still only light, not direct sun). No direct sun. Not near the heat or glare from a window. A certain coolness (as from the tiles). A certain airiness (as from the high peaked ceiling). Now that I'm thinking about it, it was a great room. Really miss it. Now that I've written this down and seen all your great info I might give those beautiful flowers a go again soon. I have a Florida Room that has 11 windows and bright and sunny. The window these are in faces North. The other side is West but the blinds are closed. I have never had problems growing them. My grandma was a magician with African Violets. Hers were always beautiful and she said she pretty much ignored them! I live in Africa. South Africa on the East coast in the city of Durban. My late granny used to pick the leaves, stick them through tin foil over a tea cup and let them take root before transplanting the African Violet into a pot. I don't ever remember her watering the plants, but I do remember that she used to put her used tea bags on top of the potting soil, and sometimes even the crushed shells of eggs. Her room was like a tropical jungle with African Violets always in full bloom and looking like they were on steroids. The fancy watering methods, the fancy foods, the special pots. None of it is as important as the light. It is everything. When I was seriously growing houseplants, there weren't LED plant lights. I knew lights were important. I tried everything that was available in the 90's. Compact fluorescent's were just getting started when I dropped out of the hobby. They are still worth trying. Cheap enough. I used many an incandescent lamp too. Anything to get more light to them than a NYC window. But now... in 2017... whole new ballgame. There are LED plant lights that use 1/10 the energy of old style light bulbs and give just as much light and in a better light spectrum for plant growth. That is where I would start if plants aren't blooming. Thanks for the pictures in the picture post. Those are really lovely, well grown plants. There was an AV show in my area last month and I saw awards on plants that didn't look half as good!!! Thanks for the pictures in the picture post. Those are really lovely, well grown plants. There was an AV show in my area last month and I saw awards on plants that didn't look half as good!! !